Reflections and Ruminations: When gratitude defines your very being, even plain vanilla is amazing. When gratitude defines your very being, even plain vanilla is amazing. I have written and reflected on numerous occasions here in this blog and in some of my talks which I have made, that gratitude in its many forms is a hallmark of the spiritual life. If we find ourselves griping, finding fault, getting anxious over the small issues of life, and getting piqued most of our time, it may well show that we have hardly made any significant inroads to spiritual maturity and real character formation. One can hardly make any references to the nurturing of one’s spiritual life without emphasizing just how important the spirit of gratitude should form the foundation of one’s quest for wholeness. To be a saint is to be a thankful person, and to live a life with a heart that is constantly warmed and seized by gratitude. The very image of a thankless heart that is shored up by ingratitude and a refusal to appreciate and to show any signs of acknowledgement conjures up a heart that is cold and hard, much like a stone. The phrase ‘hard-hearted’ readily comes to mind. However, notice how one automatically warms up to another human being who exudes gratitude and grace. But one can imperceptibly detect a solidified and unyielding presence in one who cannot enjoy any gift that one is given. This makes it almost an imperative for a follower of Christ to begin nurturing the spirit of gratitude from a very early age. But if encouraging thankfulness is only done at ‘special’ occasions, like on Christmas, or birthday celebrations, or at the milestone success points in life, it can give one the impression that at other ‘non important’ or ‘plain vanilla’ events of life, where the horizon is an undisturbed open sea before one’s vista, that there is hardly any need to express our gratitude for things that one has been generously given, but perhaps not readily seen and truly appreciated. Perhaps the real challenge that faces so many of us is that we have not really nurtured in ourselves that habit of being thankful for the small, ordinary and everyday things and have sadly taken so many of them for granted. And when the small and seemingly inconsequential things are taken for granted, it can, ipso facto, make it just as easy to take the ‘big ticket’ things for granted when they are made manifest in our lives. I am quite certain that Jesus taught this incipiently at the multiplication of the loaves and fish on that Mount of Beatitudes. In the sea of a multitude of people, the only provender that Jesus and his disciples had was five loaves and two tiny fish. Even if they were sturgeons, it would be a task and a half to feed 5000 people. But here is where Jesus indirectly teaches the importance and potency of gratitude – he raises his eyes to heaven and gives thanks. How can one sincerely give thanks for such a tiny portion before such a massive gathering? It seems to be beyond logic, and perhaps it is. We often miss the point that if we are only living in the ‘this-ness’ of the world, amazing things will not be allowed to happen. One can speculate all one wants about how the multiplication took place. Some pundits have said that there was actually enough food in the crowd, but they were too afraid to share for reasons only they would know, but when the spirit of thankfulness caught on, their food parcels and satchels that they were carrying opened while their hearts did the same. Even if this were actually what happened, a miracle did take place, because the act of thanksgiving made turned the inward serving crowd into an outward sharing people. At the heart of the issue is perhaps another human tendency, albeit a rather flawed one. We have an inner need to earn and merit what we have in life. Our ego gets puffed up a little when we know that it was through our hard work and talents and efforts that enable us to enjoy what we have before us in life. The extreme display of this is an arrogance and a cockiness of self in thinking that one can merit heaven at the end of one’s life. Perhaps we may even see shades of this in ourselves when we tick off our spiritual checklist items like prayer, devotions, fastings, works of mercy and Mass attendances. Scripture tells us that even the just man sins seven times a day, making the Confiteor that we say at the beginning of each Eucharistic Celebration such deep and important significance. The more one is touched by the mercy of God, the more one can grow in one’s attitude of gratitude. If one only encounters the rich mercy of God in the Sacrament of Reconciliation once a year, one hardly nurtures that spirit of gratitude for the things in life that are ordinary and easily by-passed in life. Yes, even for the things that are ‘plain vanilla’. Thank you for your Monday blogs. These blogs have been spiritual food for readers like me. And yes, let us be thankful to people and God in the ordinariness of our lives. Lol...Reading your blog on Mondays has become a sort of "plain vanilla" for me. Nothing exotic...no complex flavors, no convoluted methods to view the world, and you definitely offer no quick fix answer. What you are offering is just the plain old vanilla ways towards the Kingdom of God. And that, Father, is mighty SPECIAL! Finding vanilla in the mundane does make one's life magical! "The great Creator and Ruler of all things sees to our needs with mercy even while He remains our Judge. This ought to be a motivation for many different kinds of tears, not the least of which are tears of gratitude. Recognition of God’s greatness and all that He has done for us, especially in the redeeming work of His Son on the Cross, must move us at all levels of the mind and heart." When I was given a nondescript brownish vanilla pod and told to put it into the kitchen cabinet, I was not prepared for the light, delightful fragrance whenever I opened that drawer…………………and along with it, the half-forgotten promise of iced-cupcakes, strawberry brittles and homey scones. It was much later, that the over familiarity with vanilla especially in ice-creams - that earned it the dubious and rather insulting sobriquet of “plain” vanilla- for something common, bland and boring. Perhaps that is what happens too when we reflect on the ordinariness or some even termed it the humdrum-ness of daily existence! We may feel that we need to be grateful only for the big items that we have received in our lives because we have over-looked and taken for granted the little simple and ordinary things in life. Over-familiarity in our daily experiences makes us dismiss with contempt the small happenings. 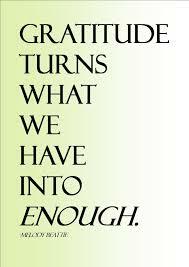 We cannot appreciate and hence do not know how to be grateful for them. I recalled what G.K. Chesterton once said about having lost the ‘sense of wonder.’ Perhaps, we have lost this sense of wonder in the ordinary - and with it, the sense of gratitude. We view things based on its relevance, its utility and accord it a measure of importance and as such, we will hunger and long for newer, bigger and more exotic things or experiences and probably we will feel grateful (momentarily) only when we have grasped and experienced it. Reflecting on this, I feel that it is necessary to pray for the grace to be child-like, so as to always have a sense of wonder and so - be grateful for the ordinary things of life – such as, a whiff of home-made bread on a lazy afternoon, an interesting book by your favourite author to burrow into late at night or enjoying plain vanilla ice-cream with your kids.